Runs for Cookies: I ran through Hell! Today was my first 10k race! There is a town in Michigan that is named Hell... and they had a 5k/10k race today called "Run Through Hell on Halloween". Renee and I signed up for the 10k, and my friends Evie, Kerri, and Jessica signed up for the 5k. The race was at 9:30 this morning and Hell was about an hour away. We met at Jessica's house and she drove us all in her minivan. I didn't want to go all-out and wear a costume, but I wanted to be a little festive, so last night Renee and I went to Target and bought some Halloween socks. I had a shirt that said "BOO" on it that I bought at Goodwill, so I wore that too. It was FREEZING--31 degrees in Hell this morning! Anyway, we got there, picked up our packets, used the porta-potties (eww!) and then lined up for the race. I was shivering so badly while we waited. I was bouncing up and down, trying to keep my toes from going completely numb. 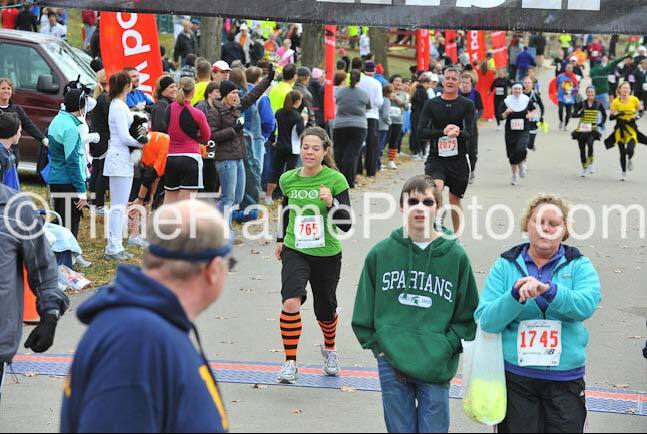 Renee and I were toward the front, because I learned that lesson the hard way in the Detroit 5k. I didn't want to have to dodge people to get up to my pace. Renee was hoping to finish in under 50 minutes, so she was going to fly past me right away. Finally, the race started. I started running at it felt like EVERYONE was passing me. I was afraid to turn around and look. There were 3,000 people running (all the 5k and 10k people started together, and then it split off after 3/4 of a mile). I just kept reminding myself that I don't have to rush, I could just do my "happy pace" and finish the damn thing. There were so. many. hills. Ugh! I even checked out the elevation online before we went, but it didn't prepare me for this. One hill after another, and the whole course was a dirt road. We went 3.1 miles out, and then turned around and headed back to total the 6.2 miles. Once I made the turn-around, I saw that I wasn't even CLOSE to being last. After I passed mile 4, I saw people that were still before the mile 2 marker. I felt pretty good the whole way. The hills were tough, but I had read that if you take small but quick strides on hills, it makes them a lot easier. And that helped a lot. You don't feel the incline nearly as much when you do it that way. The last mile was almost all downhill, so I finished pretty strong. My finish time was 56:25 (that's a 9:05/mile average). I placed 23rd in my age group, which I don't think is very good, but I have no idea how many were in my age group. Renee finished in 47-something. She placed 4th in her age group! I hope I'm that fast someday. I'm just catching up on your blog and after reading this post I got really excited. I signed up for my first 5k in Feb 2012 and I'm training using the couch to 5k method. Reading about your experience motivates me even more!